With all of the rain that central Ohio has been receiving (although it’s hard to remember the cold, damp, rainy days of a few weeks ago with the temperatures now in the 90’s outside), there has been an increased amount of stormwater getting into our streams, rivers, and sewer systems. Unfortunately, this water contains many contaminants: pesticides, road salt, oil, gas, sediment, nitrogen, and phosphorous. These pollutants come from a variety of sources, including pet waste, lawn fertilizers, cars, construction sites, and pesticide application. All of this means that the health of our waterways suffers. An easy and simple way to cut down the amount of stormwater getting into our waterways and sewers is to use rain barrels to collect run-off from roofs. Pete and I have two connected rain barrels at our house and are contemplating a third barrel. We seem to have run out of downspouts to use! One of our downspouts is emptying into our rain garden that we’ve created in part of our backyard. (We’ll have more on rain gardens in another post.) These barrels are wonderful for watering our indoor plants, and my cottage garden, which is made up of a mix of native and non-native plants. It’s the non-natives that require more water. On top of all of that, rain water is pure; it doesn’t contain dissolved substances (like salt) that can be found in city water. Salt water is fine for boiling pasta but not so good for plants. And we save money, too, on our water bill. The Franklin County Soil and Water Conservation District and FLOW (Friends of the Lower Olentangy Watershed) have teamed up to help homeowners get rain barrels. FCSWD has a lot of information about installing rain barrels as does FLOW. In addition to rain barrels, one of the benefits of trees is that they are very helpful in keeping stormwater out of our sewer systems and streams and rivers. 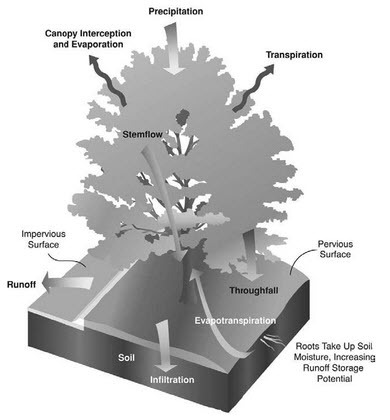 Their roots help to drive water deep into the soil, and their canopies help to store rain water to later release into the atmosphere. Trees additionally provide other benefits: lower temperatures in the summer, lowering cooling costs, better air quality, habitat for wildlife and birds, not to mention that they are beautiful to look at! This entry was posted in Resources. Bookmark the permalink.